Hundreds of residents of southern Israel protest ceasefire agreement with Hamas, block roads in downtown Tel Aviv. Hundreds of residents of Israeli towns near the Gaza Strip gathered in downtown Tel Aviv Thursday evening to protest the Israeli government’s decision to accept a ceasefire agreement with the Hamas terrorist organization brokered by Egypt earlier this week. 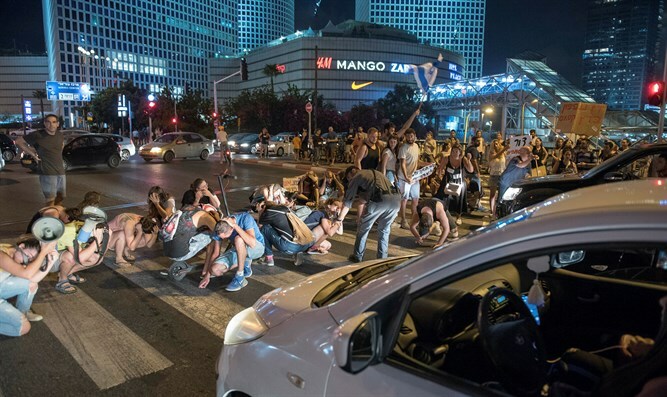 The demonstrators gathered outside of the IDF headquarters at the Kirya complex in Tel Aviv, and blocked roads at the Azrieli intersection, ahead of a planned meeting between Prime Minister Binyamin Netanyahu and community leaders from towns near the Gaza Strip. Signs held up by protesters Thursday evening read “Bibi [Netanyahu] is weak against Hamas” and “We Want Security!”. On Tuesday, Arab media outlets reported that a breakthrough had been reached by the Egyptian mediators. The ceasefire proposal was later accepted by the Israeli cabinet, over the objections of several ministers, including Education Minister Naftali Bennett (Jewish Home) and Avigdor Liberman (Yisrael Beytenu), who resigned his position a day later. Some 500 rockets and mortar shells were launched from the Hamas-ruled coastal enclave towards Israel prior to the ceasefire agreement, following an incident in the southern Gaza Strip between an elite IDF special forces unit and a cell of Hamas terrorists. One person was killed and nearly 60 more injured in the rocket attacks. One IDF officer was killed in the incident, and a second officer wounded. Seven Hamas terrorists, including a senior officer in Hamas’ military wing, were also killed in the battle. While the IDF launched a broad air campaign against terrorist positions in the Gaza Strip in response to the rocket attacks, only six casualties were reported. An IDF spokesperson said the army had ensured that the terrorist positions and surrounding buildings were evacuated prior to the strikes, in an effort to reduce civilian casualties.